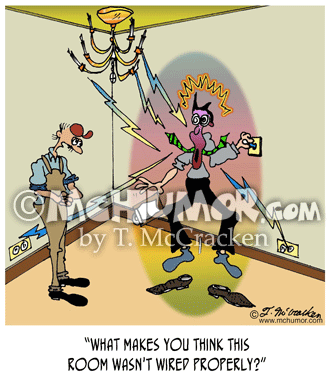 Electrician Cartoon 6387: A building inspector being zapped and lighting up. A contractor asks, "What makes you think this room wasn't wired properly?" 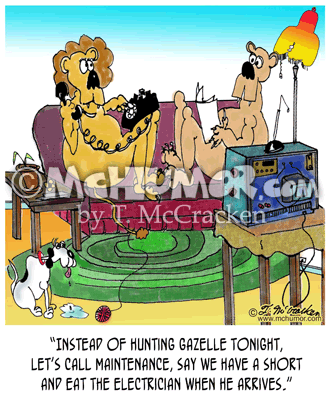 Electrician Cartoon 7297: A lion in an apartment saying to his mate, "Instead of hunting gazelle tonight, let's call maintenance, say we have a short and eat the electrician when he arrives?" 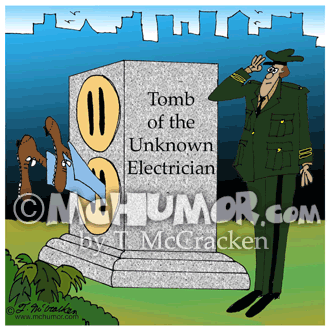 Electrician Cartoon 7171: "Tomb of the Unknown Electrician." A general salutes a huge electric socket with legs sticking out of it. 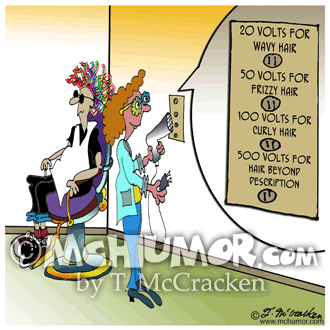 Beauty Cartoon 7758: Someone with wild hair sits in a salon where the hair drier sockets are "20 Volts for Wavy Hair," 50 Volts for Frizzy Hair," "100 Volts for Curly Hair," and "500 Volts for Hair beyond description." 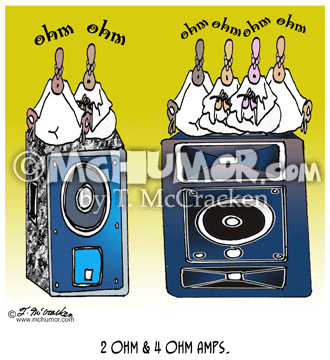 Audio Cartoon 7670: "2 Ohm and 4 Ohm Amps." On top of speakers are two and four cross-legged gurus chanting "Ohm." 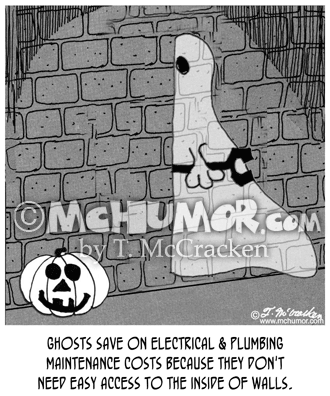 Ghost Cartoon 7992: "Ghosts save on electrical & plumbing maintenance costs because they don't need easy access to the inside of walls." A ghost walks through a wall. 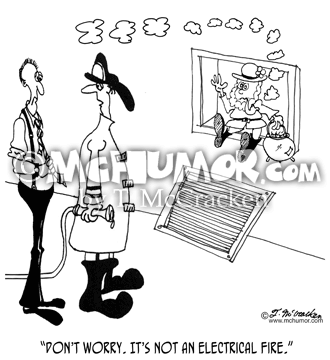 St. Patrick's Day Cartoon 7995: A fireman looking at leprechaun smoking a pipe in air duct says to someone in an office, "Don't worry. It's not an electrical fire." 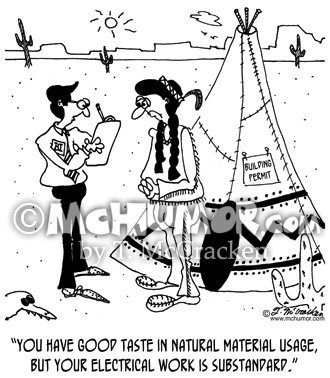 Electrician Cartoon 6354: A building inspector says to a Native American standing in front of a teepee, "You have good taste in natural material usage, but your electrical work is substandard." 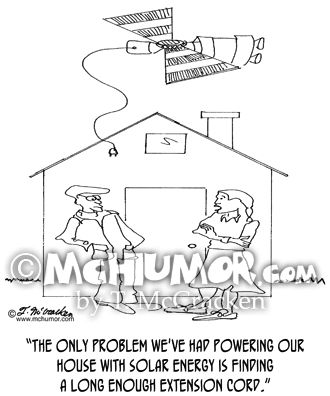 Solar Cartoon 0521: Someone looking at satellite above house says, "The only problem we've had powering our house with solar energy is finding a long enough extension cord." 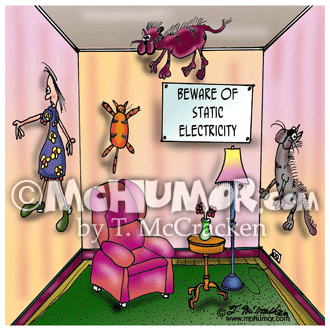 Cat Cartoon 5996: People and cats hanging from the ceiling and wall near a sign, "Beware of Static Electricity."